Where are you this Thanksgiving? Sitting in front of a fire? Stuffing your face with turkey and dressing? Spending time with family and friends? I’m doing much of the above with one very special addition – Completing projects for my SLP graduate program. While some of the reason I’m working through Thanksgiving is slight procrastination, many items such as studying could not be started until we finished covering the material. *Insert sighs and groans here* I’ve decided after almost 6 years of undergraduate and graduate coursework that “breaks” from school really mean time to spend not in class and working on endless projects related to summarizing or studying. If I get the opportunity to organize a syllabus in the future, I will put huge projects in the middle and make sure the final exam comes before Thanksgiving. That way after the food-filled holiday students could just come to class and learn “fun/interesting” things that we didn’t have time to cover. I realize I may be a little naive about the college professor role, but it’s my blog and I will say my two cents worth. Until then, I will sit here on the couch while my family slaves over the most delicious meal and put together an assessment and intervention portfolio for dementia, TBI, and aphasia. Followed only by a slightly more exciting time of studying for my Motor Speech Disorders final test covering management of the dysarthrias and Apraxia of Spech. 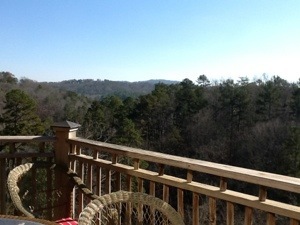 If only I got bonus points for when and where I do the work….tell me this view isn’t beautiful? !